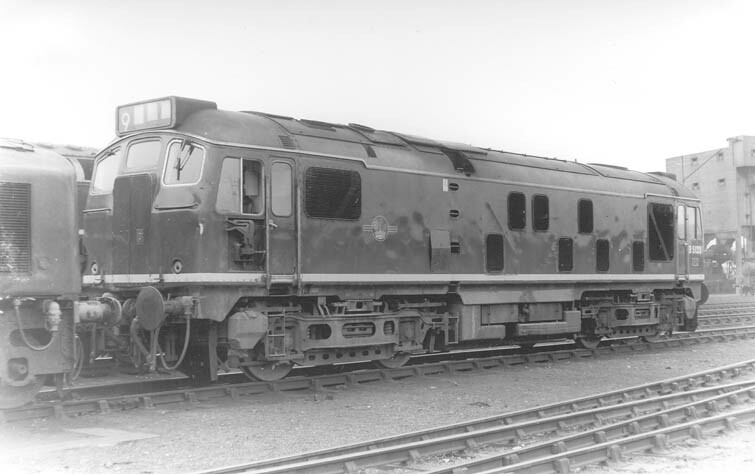 The sixteen year career of D5123/24123 was spent allocated only to Scottish Region depots. June 1976 to store (unserviceable). 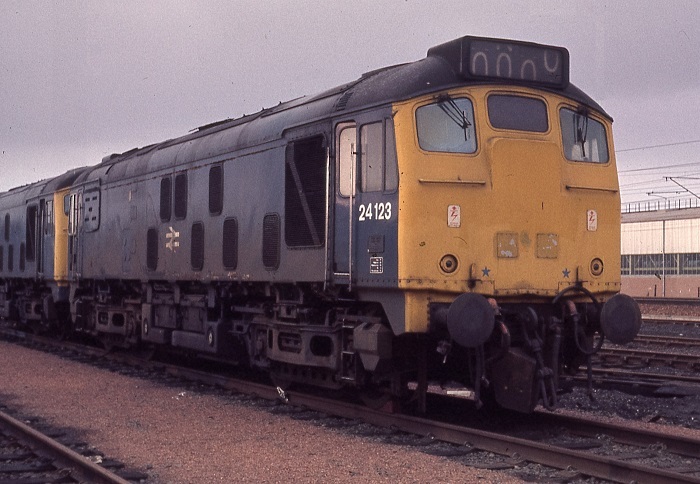 After withdrawal 24123 was stored at Polmadie until March 17th 1977 when it was moved to Doncaster Works and broken up by August 1977. Noted Glasgow Works September 1960. Noted Glasgow Works June 1971. Noted Glasgow Works October & November 1972. Noted Glasgow Works August & September 1974. D5123 was noted running light at Derby station on June 29th. Photograph courtesy Rex Conway collection. 5123 awaits its next turn of duty at an unknown location. It sports the tablet catcher, fitted after delivery to the Scottish Region. The curved roof cover for the boiler filler access has gone, as has the windscreen wiper from the second man's side of the locomotive. The locomotive also carries one of the smaller, weight saving fuel & water tanks. Condition June: no yellow warning panels added yet, running with two-piece miniature snowploughs. Condition August: small yellow warning panels, curved upper corners, warning panel covers frame level stripe, three-piece miniature snowploughs fitted (black), two exhaust ports fitted (original circular and rectangular above engine room). Photograph collection of webmaster. Roof detail of D5123 showing the two exhaust ports. Condition April: green livery with small yellow warning panels, curved upper corners, warning panel covers frame level stripe, gangway doors have weatherstripping in center only, shortened fuel & water tanks, boiler room grilles fitted, hand/footholds present, cantrail water filler present, three-rung bogie mounted footsteps, ridge sided sandboxes. three piece miniature snowploughs fitted (black), tablet catcher fitted, engine exhaust over engine room (but may still have disused exhaust port in original location). Condition no month: blue/yellow livery, gangway doors fitted with substantial weatherstripping, headlights fitted, tablet catcher fitted, steam style shedplate on cab front, shortened water and fuel tanks, blanking plates fitted (five slats), hand/footholds still fitted, cantrail water filler sheeted over, three-rung bogie mounted footsteps, ridge sided sandboxes, three-piece miniature snowploughs fitted. Condition no month: blue/yellow livery, gangway doors sheeted over, headlights fitted, shortened water and fuel tanks - both fitted with circular gauges, blanking plates fitted (five slats), hand/footholds plated over, cantrail water filler sheeted over, three-rung bogie mounted footsteps, ridge sided sandboxes, no miniature snowploughs fitted. 24123 was noted at Inverness on February 3rd. On July 18th 24123 was noted out of use at Haymarket. Photograph courtesy Tony Sayer. With less than a month left in service 24123 stands at Inverness, June 7th 1976. In placing the tablet catcher recess under the driver's window, a minor design change to the window was required. 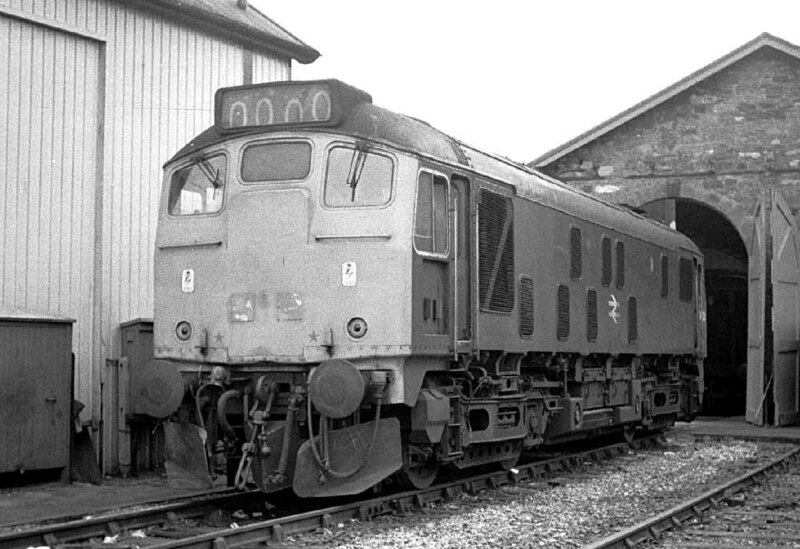 The previous droplight windows were replaced by a sliding window, which became standard on the Class 25s. Condition final: blue/yellow livery, gangway doors sheeted over, headlight location replaced with square plates, shortened water and fuel tanks - both equipped with circular gauges, blanking plates fitted (five slats - at least on BIS side), hand/footholds plated over, cantrail water filler sheeted over, three-rung bogie mounted footsteps, ridge sided sandboxes, three-piece miniatue snowploughs fitted (yellow), battery isolating switch cover - three hole modification with circular covers. 24123 at Polmadie on March 5th 1977. Page added August 16th 2016.